This holiday brownstone Gingerbread House is a multistory urban house built rather close to the street and scaled similarly to surrounding houses and of course sheathed in brown stone. 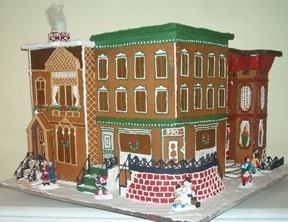 This Gingerbread Brownstone is decorated complete with a smoking chimney, holiday wreaths in the windows, jolly snowmen on the sidewalks and of course lots of people and activities. Visit here for more.